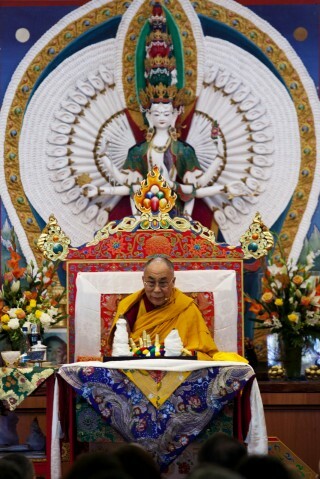 His Holiness the Dalai Lama at Chenrezig Institute, Eudlo, Queensland, Australia, June 2011. Photo by Bonnie Jenkins. His Holiness the 14th Dalai Lama, Tenzin Gyatso, is known throughout the world as a living symbol of peace and compassion. This “simple Buddhist monk,” as he often refers to himself, was born as Lhamo Dhondrup on July 6, 1935, to a farming family, in a small hamlet located in Taktser, Amdo in northeastern Tibet. At the age of three he was recognized as the reincarnation of the 13th Dalai Lama, Thubten Gyatso. You can read the complete print feature “Remembering the Kindness of His Holiness the Dalai Lama and the Courageous People of Tibet,” published in Mandala October-December 2011, which include the article “Remembering the Kindness: The Master, the Dharma Kings and the Abbot” by James Blumenthal, as a PDF.